Discussion in 'Coop & Run - Design, Construction, & Maintenance' started by NHchicks, Apr 7, 2011. Quote:A guy I work with told me he got a shed for 50 bucks outside floor model. From menards and they delivered it and fork lifted it to his spot. He was just there at the right time when they stopped selling that model. Your post made me think of this. My husband built our nice little first timer tiny 4 x 8 coop and it cost him $500 just in materials and took him like 10 straight days to build (don't laugh). Next time, like I said, I'm going pre-fab. And splurging on the extra windows. 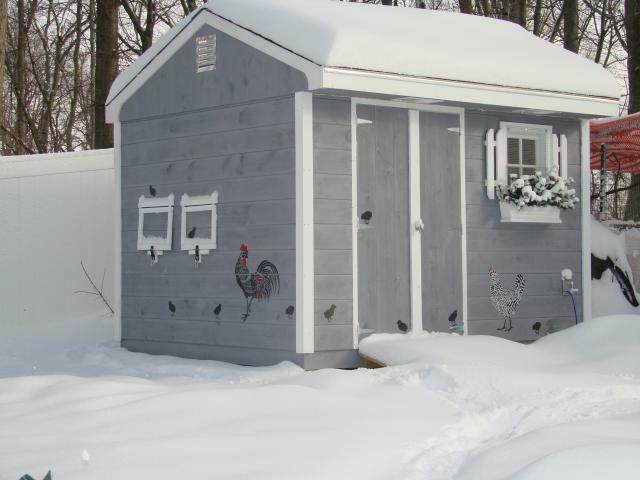 This is my modified shed coop, bought from Home Depot last fall. Delivery and assembly were included in the price - which was too high. I always look at the coop section on BYC and am so envious of all of the carpentry skills I see. I would love to do a coop project, but I know it's way over my head. I did modify my shed though, and had fun with it. Wish I could find a carpenter who was willing to take on an old woman apprentice! If you're handy, you should be able to make it yourself for less. Costco has 12'x8 shed,window, double doors and storage loft for $999 after rebate. Shipping and handling included! I'm new to this and recently got an ark,but I think it's going to be too small for my five hens. Do I convert it to their coop or run? It's an A frame 4'x7 with enclosure of roost and 2 nesting boxes on top. We priced sheds too, ended up with the metal kit from Lowes for under $300 and cut a bunch of windows in it, added foam board and wood paneling to the inside walls to prevent it turning into a hot box, and recently replaced the doors to wooden barn style doors instead of the sliders it came with. A drill and tin snips was all we needed to cut holes in it!